Did someone ask for Hercules? Not the mythical figure, mind you, but the also incredibly-strong and peak-performing outdoor shelter bearing the same name? 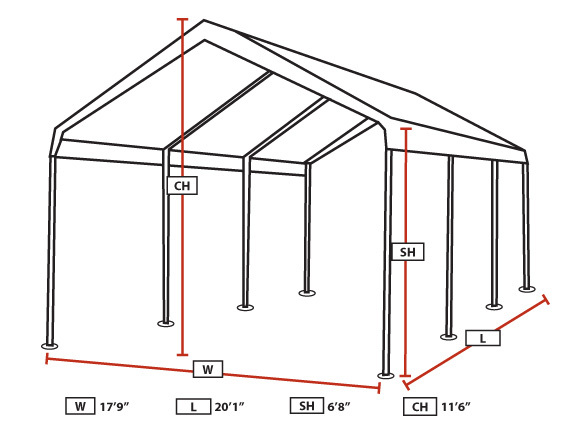 If anyone was in the market for the tent rather than the hero, check out the 18 x 20 Hercules Outdoor Canopy Shelter from King Canopy. This is a unit with a lot of space, a lot of stability, and a lot of features that help it live up to its famous moniker. 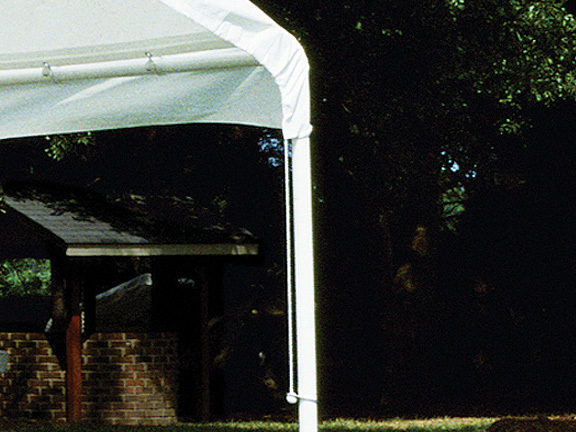 An 18 ft. x 20 ft. canopy provides tons of space for all of your outdoor activities - you probably already know that. It's so spacious, in fact, that some owners use the structure for hosting outdoor parties, while others keep a car or a piece of equipment underneath. The 2-inch diameter steel frame provides tons of strength for whatever you have planned, and the frame features a white powder-coated surface for added moisture and rust-resistance. What you may not have guessed is that the 8-leg design of this tent yields a stable, well-grounded structure thanks to all of the points of contact with the ground. The plastic foot pads protect whatever surface you choose to place this shelter on, so you can even set it up on top of a surface you'd rather not have scratched or otherwise damaged. To top it all off, there's a white polyethylene cover that is water-resistant to protect either guests or automobiles, and the top has a drawstring to really secure it to the frame. Almost every story involving Hercules involves him somehow saving the day. That's the way a lot of owners think about this shelter. 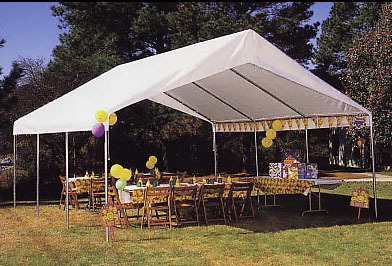 For people interested in a multi-function and affordable option for outdoor celebration or storage, the 18 x 20 Hercules Outdoor Canopy Shelter from King Canopy saves the day, saves your valuable outdoor equipment, and saves a little of what's in your wallet every time. I purchased this great canopy two and a half years ago and it's time to replace the top. Where can I find replacement tops? Ordered a Tent. Got a Tent. Covered my head. ConsSome polls we dented which scares me a bit about how they'd hold up in a storm. (Not that I'd have it set up in one) It's packaging was also pretty tattered upon arrival. If this came with a bag to store it in that would be a huge plus. I own a party rental business and this is one of my favorite tents! It is very easy and quick to setup/breakdown and covers up to 64 people seated. The foot pads actually were made of metal instead of plastic like it says in the description and they give the tent a ton of extra support. I ordered the suggested anchor kit with this tent, but was not a huge fan. They did not work as well as I wanted them to. If there is not more than a slight breeze when using the tent is fine not to anchor. Great outdoor canopy for a cheap price. Better than renting one for a higher price!